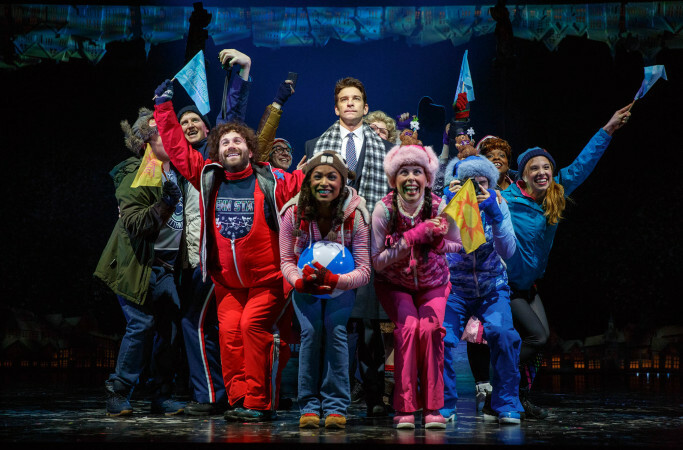 Reuniting many of the high wattage talents behind Matilda, new musical Groundhog Day is a slickly produced, crowd-pleasing show in the best Broadway tradition. Multi-talented Australian writer/performer Tim Minchin unveiled his seemingly instant talent for music theatre composition with the instantly hummable, sneakily subversive music and lyrics for Matilda. Arriving in reasonably prompt succession, Minchin’s score for Groundhog Day shows an even greater coherency, confidence and sophistication. On first listen, it may be missing some of the breakout stand-alone songs of Matilda, but in providing recurring motifs simultaneously with musical progression, Minchin has done an excellent job. Minchin’s innate knowledge of the genre is again on display in Groundhog Day. Just as he inverted the form of the charm song with “Loud” and “Telly” for Matilda’s repulsive parents, here Minchin boldly reverses the traditional opening I wish song, allowing his chief protagonist to profess a dream that the audience already knows he will not achieve. Vain weather man Phil Connors, sings at length of his desire to quickly leave “Small Town, USA,” which anyone with even a vague knowledge of the 1993 film knows will not be happening. Groundhog Day is one of those productions where it is very clear that the entire creative team has worked together in close collaboration. This cohesive approach seems to be common whenever director Matthew Warchus is at the helm. 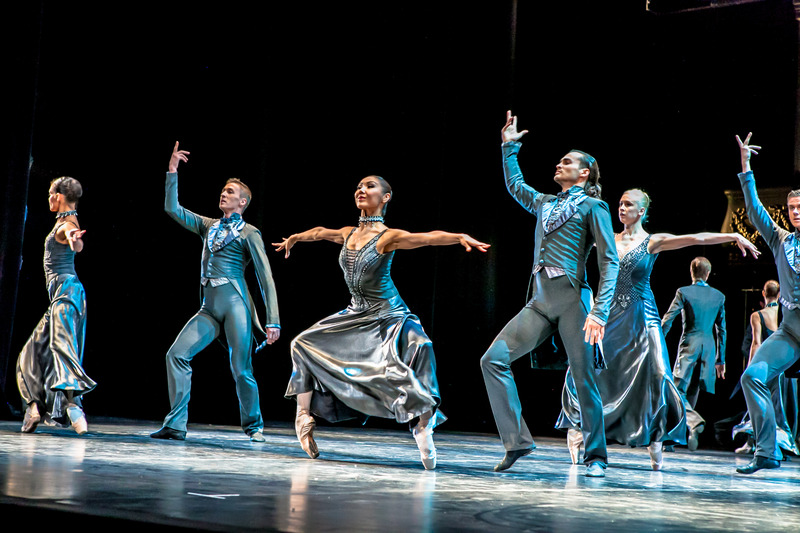 As the show unfolds, musical numbers intertwine with book scenes, allowing sung and spoken word to merge seamlessly with choreography, which involves not only the actors but also the fluid movement of scenic elements, which are alternately highlighted and hidden by lighting. 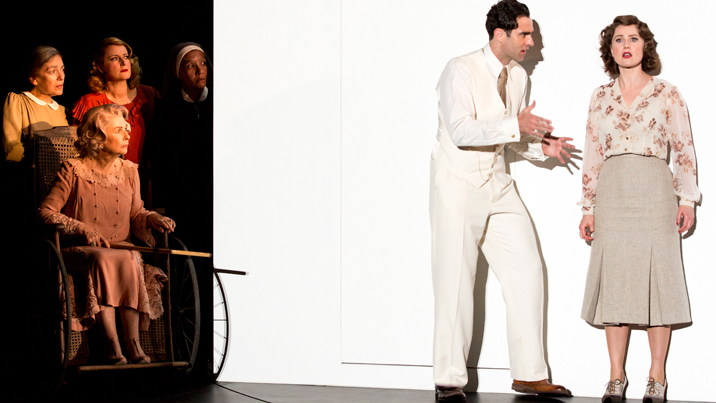 Anyone who had the good fortune to see Warchus’ underappreciated 2002 West End musical Our House will vividly remember the way Warchus switched between parallel threads by having lead character Joe magically jump from “good” (in white) to “bad” (in black). 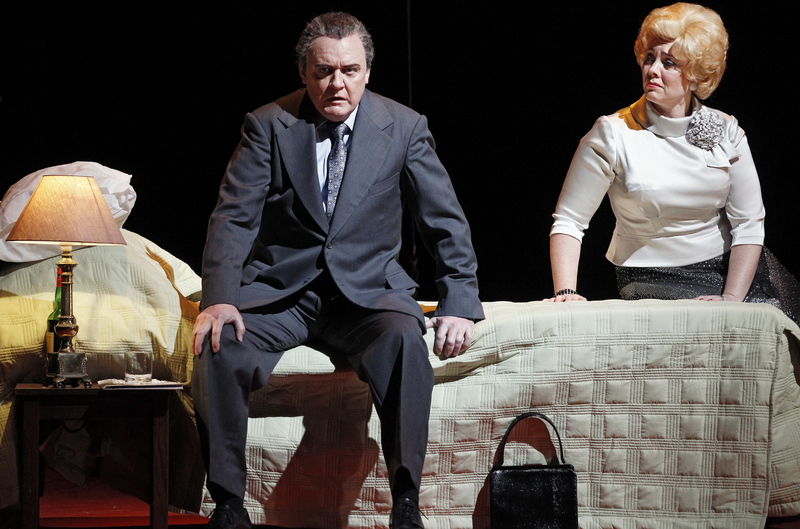 Similar tricks are used to great effect here, as Phil finds himself back in bed the next morning each day no matter what scene he has just completed on stage. Designer Rob Howell frames the stage with rows of miniature houses, A cinematic flow is achieved with concentric revolves. Howell’s signature piece for the show is a stunning collage of rectangular screens against the swirl of pressure bars on a weather map. This constitutes the glossy show curtain that greets the audience with multiple images of weatherman Phil in action, and is seen again in new incarnations for each bar and restaurant scene in the show. Hugh Vanstone not only lights the windows of the tiny houses beautifully, but also adds striking effects such as swirling snow and festive fireworks. Danny Rubin, co-writer of the movie, has adapted the work for the stage, clearly working closely with Minchin to deepen the characters and to create an involving dramatic arc. Phil moves from disbelief to incredulity to uninhibited joy to suicidal depression to noble sensitivity, taking the audience with him at every step. 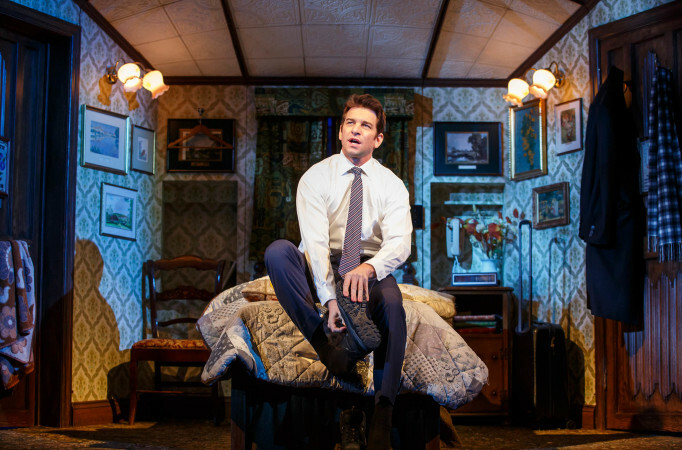 A massive part of the success of Phil’s journey is the star-making lead performance of Andy Karl. Beginning as a genuinely unlikeable guy, Karl makes Phil’s redemption so gradual and subtle that it is as believable as it is involving. As Phil’s eventual love interest Rita, Barrett Doss gives a breakout performance, singing superbly and maintaining a charming, natural presence in the role. Each member of the large company has their chance to shine, bringing the quirky townsfolk to life with memorable impact. 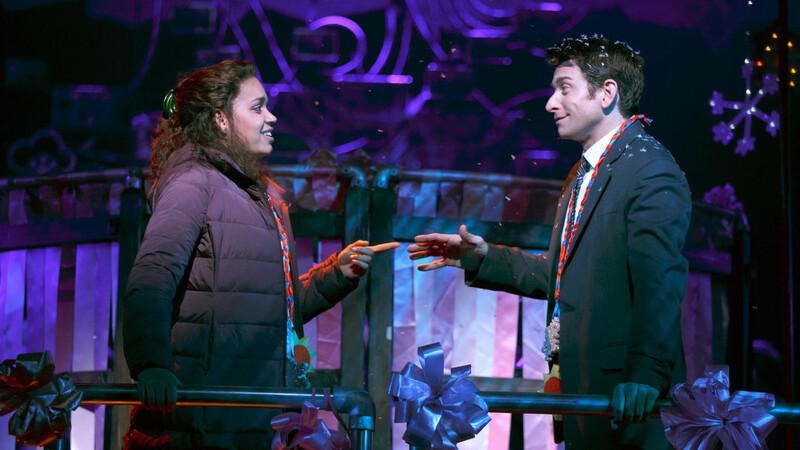 Groundhog Day enjoyed a successful premiere season last year at London’s Old Vic Theatre. Although Broadway tends not to favour imported shows, the American flavour of may help it to last the distance. Hopefully the new musical will be a big enough hit to allow it to play Australia in the near future. 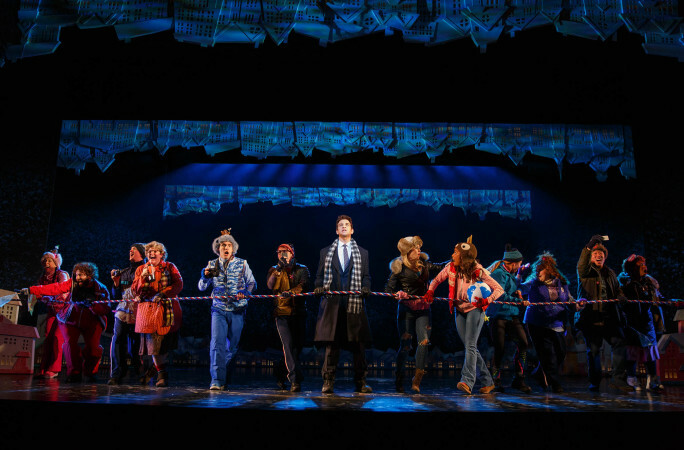 Groundhog Day was reviewed 8pm Monday 3 April 2017 at August Wilson Theatre, New York. Glad you enjoyed the show as well. This is a terrific theatre guide. Would be very helpful to new visitors. Thanks for sharing! Hi Simon. I saw the show on Friday night. I was really disappointed. Unemotional & I felt no connection to the characters. Minchin’s music nowhere near as good as Matilda. Sorry to her you didn’t enjoy this Danny. I definitely agree that the music of Matilda is better, although I can also see what Minchin was going fro here. 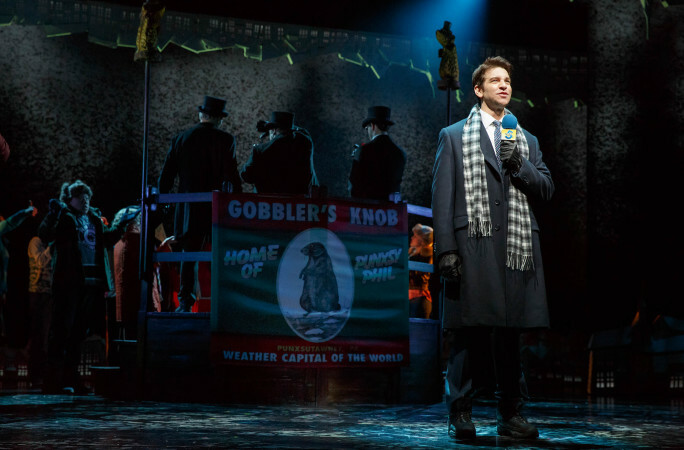 It will be interesting to see what happens with the show in the next few days now that Andy Karl is injured as he is such a massive part of the show.